Some of the issues: why don’t we have more RIM-like companies? Why do we sell out too early? How can we be better at commercialization of technology? 1. People – recruiting & engaging with ownership. Very difficult to bring in managers as founders and give them stock. That’s we have stock options. This isn’t the place to get into it, but this is a major impediment to innovation (see my other posts for specifics on this). There are major barriers put up by CRA – many MPs I’ve talked to aren’t aware of what the Finance Dept is pushing through (when they are made aware, they agree). It’s a difficult & complex subject – votes aren’t gained or lost on this. As to where the people come from, our immigration policies are yet another barrier to recruiting global talent. 2. Capital – esp Startup funding – we need to encourage angel investing (Tax credits), angel pooling, etc BUT we should also open the doors to non-accredited angels (how many millionaires in Canada have the time and inclination to invest in speculative tech start-ups?). Securities rules and regulations are archaic and need major overhaul. Talk about red tape – this isn’t red tape – it’s YELLOW police lines keeping investors out. There’s a big gap between accessing angel money and man-on-the street retail money. WHY can’t we do in tech what was done in the RESOURCE sector ? e.g. flow-through tax credits, more effectively use the public markets or for that matter, CREATE a pre-public market. Pubco’s can lead to gazelles because empire builders can use pubco shares as currency. I’m concerned with our various province’s paranoia about having a National Regulator. At a recent BC meeting, I was told that Ontario is not business friendly (as regards Securities Regulation) – if that’s true, then that’s what needs to be fixed. Canada is the ONLY country in the world that has several regulators – it means more yellow tape, less access to investors. We all need to think more nationally. 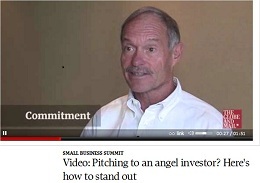 In BC, we have a 30% tax credit program for angel investors. This should be available to non-accredited investors. Why does BC have tax credits that all Canadians can’t access? Is this the way to build a nation? Example – in BC, accredited (ONLY) investors can get back 76% of their capital back in less than ONE year using VCCs and RRSPs. It’s a FACT. Not a tough sell. You have to have a pretty marginal business to miss out on this. SUGGESTION: Let’s have a National Tax Credits (50/50 maybe) OR as an alternative, let investors (including non-accrediteds) invest, sign a risk acknowledgement affidavit, take a 100% write-off immediately (take an ABIL or Cap Loss) – that would address the regulatory concerns AND provide a form of flow-through (tax credit alternative) to investors. WE WOULD HAVE NO CAPITAL SHORTFALL. 3. Research, Development and Commercialization infrastructure R&D: We need to encourage and reward University researchers for working with companies – recognition, part of the tenure track evaluations, teaching relief, etc. (In B.C., we did this very successfully with the B.C. Advanced Systems Institute by giving researchers fellowships and teaching relief on the condition that they collaborate with industry). Encourage risk-taking and promote entrepreneurship. Treat failure as a learning experience. What are the Americans doing? I attended the Consumer Electronics Show in Las Vegas in early January. They, like us, are worried about the future. In the USA, there’s a so-called INNOVATION MOVEMENT – see http://www.innovation-movement.com. Interestingly, they are wrestling with many of the same issues as we are. Hi Mike and thanks for sharing your thoughts. I’m always excited to see a new post pop up from you! As someone who isn’t eligible to take advantage of the 30% tax credit (yet! ), it really irks me! If I’m allowed to go out and gamble my money away at a local casino (which the government makes a killing off), why can’t I invest in the future of our country and be rewarded for it. I couldn’t agree more with your other points as well. We need to build a system that creates incentive for companies to go for it instead of selling out down south! If there’s a petition, sign me up :)!